It’s the future. Food is scarce, and that scarcity has given birth to the ultimate cooking show, Starve, which pits chefs against each other to cook the most fantastic, most rare, dishes in sometimes-hostile environments. Starve #4 hit the spinners this week, and with it another challenge for Gavin Cruikshank, once lost and now found chef extraordinaire, as he returns to the show he created, dominated, and walked away from. Thus far each issue has been built around a challenge on the TV show. In this issue we see how expansive a cooking arena can be and just how many boiling pots can be on the stove. Last issue saw Gavin take his daughter with him into the arena, strengthening their wobbly relationship while driving a wedge deeper into the relationship with Greer, his ex-wife. This issue is the beginning of Greer’s revenge. Pitted against his archrival, Roman, Gavin must survive the most brutal of fights, a 24 hour kitchen battle that spans the city. His team must literally fight their way into kitchens, physically defeat the staff, and then cook one course of the a meal. I know. Writing it out, it doesn’t sound nearly as exciting as it is when you read it. But dang, those pages scoot by really fast. Brian Wood has got that smart writing ability to weave in the personal history of his main characters, attaching it tightly to the story. This is Gavin’s redemption, in the public eye certainly, but more so with his daughter, who he loves but can’t seem to figure out. He took a long break from parenting, and really can’t understand why his daughter would think to help him in the first place, but at the same time cannot understand why he should be so lucky to have her in his life. Gavin is the best at what he does, a Wolverine of the Wasabi, the Culinary Captain. His identity is so wrapped up in the food and the showmanship of it, that he really has no idea who he is. This is his reawakening. Trying to find out who he is based on who his daughter thinks he is. Danijel Zezelj brings his graphic artists’ eye to the comic work here, and the colors by Dave Stewart are fantastic. It’s dark and gloomy and wonderful. Even the bright points are done in kind of sickening colors, mustards and oranges, so that you can get that feeling of disgust at the media empire that has grown around this show. Zezelj uses a lot of black, similar to Frank Miller, but when the colors come into play they are almost monochromatic. The panels with Greer are usually pages of dark purples and blues, while Gavins’ pages are blacks and greys. It seems like no characters’ face is ever shown completely, except for Gavin’s daughter, Angie. Perhaps it’s just the way it worked out, but maybe it’s because Angie is the only character who is pure. She’s there for her father and for her love of cooking. (And I could be reading too much into it as well, which is our wont as reviewers and consumers.) It’s visually a great way to showcase the story. Starve #4 has all the right ingredients. Brian Wood’s story is fantastic and gripping, while Zezelj and Stewart combine for a powerhouse art team. 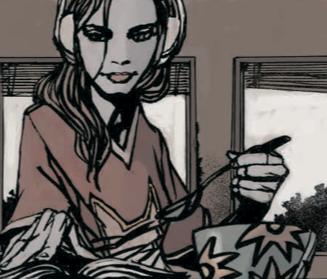 Starve, like a great recipe, constantly leaves you wanting more, and so far, doesn’t disappoint. This entry was posted in brad gischia, Brian Wood, Comic Book Reviews, image comics and tagged brian wood, Danijel Zezelj, dave stewart, image comics. Bookmark the permalink.